Roman Glass Face Bead 1st Century A.D.
Stained glass continued in popularity into the Art Deco period of the 1920’s to the early 1940’s. The stylish Deco period architecture and stained glass differed dramatically from the earlier Art Nouveau designs. 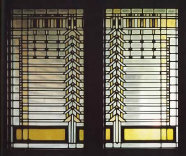 Frank Lloyd Wright, with his Prairie art style, is a prime example. Since glass is made from common sand, transformed by fire, its origins predate recorded history. Early man used minerals like gold, copper, and cobalt melted with glass to produce an array of colors for beads and other decorative ornaments. The ancient Egyptians were accomplished glassmakers by the 2nd century B.C. The Romans, based on artifacts found at Pompeii & Herculaneum, used stained glass in the 1st century A.D. During this time the Romans had glass factories producing sheet glass in Italy and France. The Romans and Greeks had been using ceramic glass chips in mosaic designs to adorn their homes and public buildings for centuries. The earliest surviving example of pictorial stained glass was excavated from Lorsch Abbey in Germany and dates from the 10th century. In the 11th & 12th centuries, as the number of churches dramatically increased, so did the quantity and complexity of religious stained glass windows. The art further evolved during the Renaissance period and glass panels became popular in homes and public buildings. In the 16th century, the Reformation, with its political & religious unrest, saw the destruction of thousands of stained glass church windows. The “art” was virtually lost until the Victorian & Edwardian eras of the 1800’s when stained glass became popular throughout Europe in non-religious windows. Until this period all stained glass was what we now call “cathedral glass”….clear glass that has been colored with minerals….but is still transparent. A major advance in glass making occurred in the late 1800’s and early 1900’s. American glassmakers led by John LaFarge started making a translucent “milky” glass known as opalescent glass. During this Art Nouveau period, Louis Comfort Tiffany popularized opalescent glass extensively in non-religious windows and lamps. Tiffany also developed the stained glass construction method utilizing copper foil that is so popular today. In this technique, copper foil tape is wrapped around each piece of glass, which then allows each piece to be soldered to the adjoining glass pieces. Previous stained glass construction back to medieval times used lead channel (came) soldered at joints to hold the pieces of glass in place. The copper foil construction method makes the artwork lighter and allows the use of finer lines and smaller glass pieces, thereby promoting more complex and detailed designs. This method also encouraged some very elaborate lampmaking. The fine detail of Louis Tiffany’s copper foiled stained glass work, his unique opalescent glass, and his flowing designs have made glasswork of the Tiffany Studios highly prized today. Modern tools, teaching methods and a ready supply of factory made, fairly inexpensive glass have made glass art and products available like never before. New homes frequently have elegant glass entryways. Many builders are using interior transoms to add light and color to interior rooms. Stained glass bathroom windows and Tiffany style lamps add color to any room. Many people now purchase window panels to hang inside their existing windows and take their stained glass when they move. Glass has evolved over thousands of years. Stained glass, as an art form, will continue to change. As long as there is light, people will always love the rainbow of colors possible as light passes through glass. A world war and a rapidly changing society slowed the evolution of stained glass. In the 1970’s stained glass regained popularity as a hobby art form. Since then, tens of thousands of people have taken classes and built windows, lamps and other glass projects. Stained glass mosaics have become a popular art form because of the limitless free form possibilities. Artists are fusing, bending and slumping glass in modern electric home kilns. Artists are evolving new forms and styles of glass art every day. The artistry of stained glass in religious windows continues in popularity. Whether Gothic style traditional windows or a more contemporary design, churches use stained glass as they have for a thousand years. Sunlight, shining through simple sand transformed by minerals and fire, creates an almost mystical sense of beauty and reverence.